This episode is chock-full of great scenes. In the first segment, Shin meets the real Action Mask for the first time! In the second segment, Shin interrupts Yoshinaga-sensei as she waits for her date to show up. In the last segment, Misae reminds Shin that he has a dog… that he hasn’t taken care of at all! The original release of ep16 had a corruption around 14:58 into episode 16. The v2 fixes it with a new encode. The subtitle script is the same. Hope everyone had a nice winter holidays! I’m back with another two episodes for you! To tell you the truth, I’ve already translated up through episode 21 (which gets us through the end of OP1/ED1). I just have to sit down and finalize the scripts and the video, all of which still takes a good deal of time. I’m hoping to get those out sooner than later, but for now enjoy these two episodes! 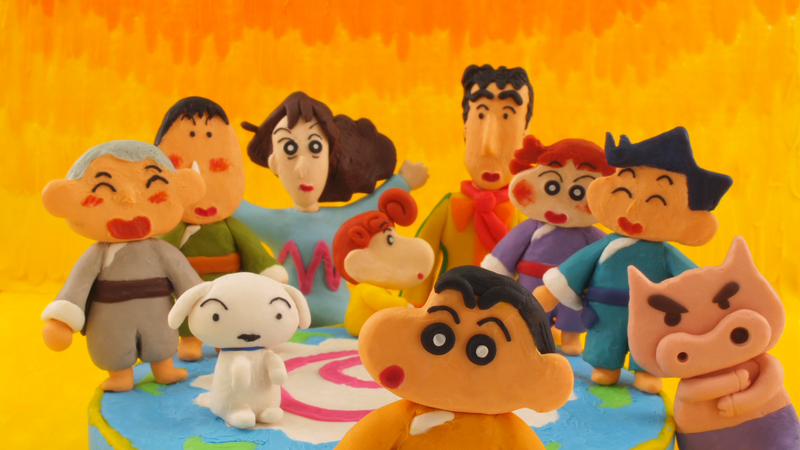 Fresh off the presses, here is the latest Shin-chan movie RAW, without subs. I’ve included all the trailers, teasers, and production art. The announcement teaser for movie 27 is also included. I’m not sure when I’ll get around to subbing this, and I don’t plan on doing a 720p RAW encode. Sorry! I will, however, give you translation of the short announcement teaser for movie 27. Hiroshi: What the heck is going on?! In Theaters Friday, April 19, 2019!! Already, movie 27 looks pretty interesting to me! I hope to get back to releasing some new subs soon. Sorry for the long wait. Summer break is over here in Japan, so that means vacation time is over, and it’s back to work! 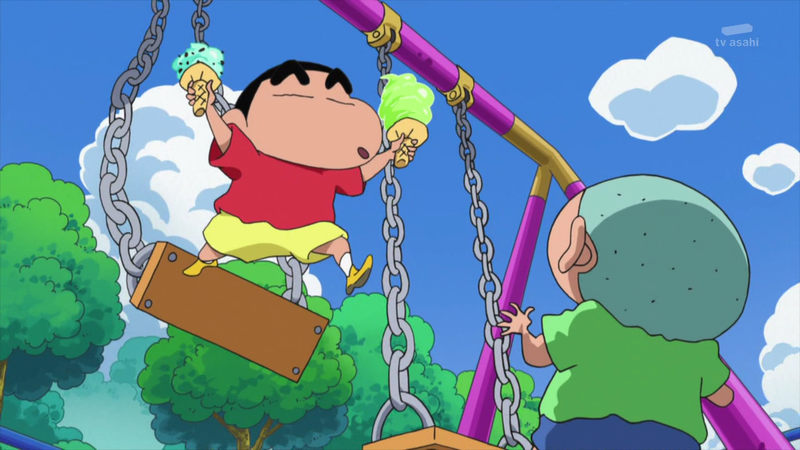 This episode of Shin-chan does not reair on TV for some particular reason. I have a feeling it might be the haphazard use of fireworks in the final segment, despite it coming with a warning attached. The next release shall be episode 15. I already have it translated, but I still need to work on the video. It’ll take me quite awhile before I finish. Sorry! The premiere of the new voice of Shin-chan. Don’t be too harsh on her while watching this. It’s her first episode. On my first listen, all I could do was compare it to Yajima’s Shin-chan, making me feel like someone just took a Shin-chan episode and dubbed themselves over Shin-chan, but after watching the episode a few times, I started to appreciate it more. I’m sure we’ll get used to it in time. And sorry that this release is coming a bit later than I anticipated. There has been extremely severe weather in Japan the past few days. Nonstop heavy rain that led to flooding and landslides. My internet was actually out for the majority of today, so that put a big halt on my work. You’ll notice that during the second segment of the episode, there are some weather warnings at the top of the screen too. I tried to see if I could get a source without any warnings, but TV Asahi is actually the best available one. Some other channels letterboxed the entire episode with huge bars of weather warnings. There are a few translation notes for this episode, so check them out. In a first for the series, all three segments in episode 13 are interlinked. The Nohara family takes a short trip to the beach. Also, I’m hoping to get 970 out tonight after it airs. I’m hoping to not have any problems, but if I do, or if the typesetting needed is extreme, I’ll have to push it back a day or so. I’m looking forward to the episode just as much as anyone else.